The Council of Management presents its Report, which forms the Trustees’ Annual Report required by charity law and the Directors’ Report required by company law, and the Financial Statements for the year ended 31 December 2017. The Society is a company limited by guarantee (having no share capital), registered in England and Wales No. 2167853, and a charity registered in England and Wales (No. 298328) and in Scotland (SC037603). The Society is governed by its Articles of Association and these set out the Society’s objects which may be summarised as to preserve in operation paddle steamers, to educate the public in their historical significance and to preserve and exhibit a collection of equipment and material associated with paddle steamers. The Society's principal activities are to assist in the preservation in sailing condition of the Paddle Steamers Waverley and Kingswear Castle and to maintain a collection of historical material relating to paddle steamers. The Society provides public benefit by making grants to charities to enable them to maintain their vessels so the public may sail on them; by maintaining a collection of artefacts accessible for research purposes; by holding public meetings relating to paddle steamers; and by publishing current and historical information relating to paddle steamers. The trustees have paid due regard to Charity Commission guidance on public benefit in deciding what activities the Society should undertake. The Council of Management controls the Society and met three times in 2017 in London and Glasgow. The Society operates both at UK and local levels, through five area Branches. The five Branches organise public meetings in winter, arrange outings, assist in promoting sailings and carry on fund raising in summer. Members also participated in working parties on PS Waverley at Glasgow. The five Branch Committees are given delegated authority over 20% of the subscription income attributed to their areas and promote the Society and organise activities locally. 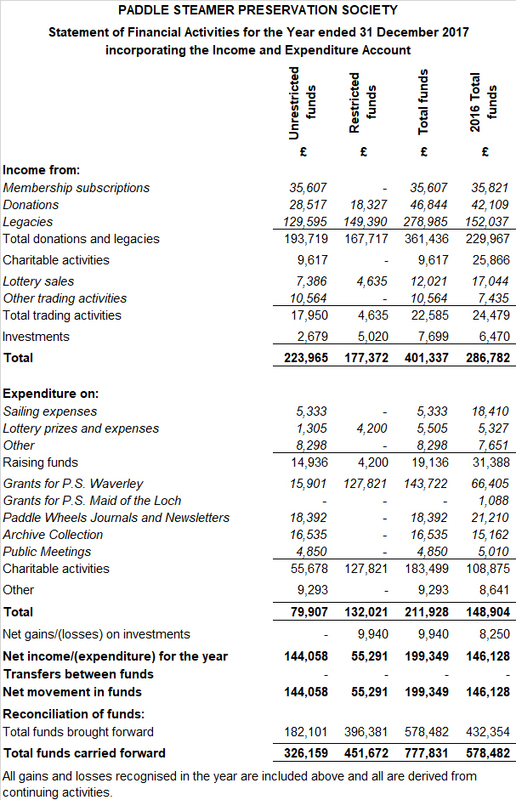 The Society Accounts for 2017 show a net income of £199,249 (2016: net income of £146,128). At 31 December 2017 the unrestricted funds comprised the General Fund standing at £107,258 (2016: £86,820) and the Archive Development Fund at £48,651 (2016: £47,385) while the restricted funds of the Restoration and Preservation Fund (devoted to Paddle Steamers Waverley and Kingswear Castle) stood at £451,672 (2016: £396,381), of which £11,662 (2016: £30,041) was specifically for Waverley and £7,656 (2016: £7,556) specifically for Kingswear Castle. The Society is fortunate to benefit from sometimes very substantial bequests from its members and supporters and in 2017 an exceptional total of £278,985 (2016: £152,037) was received. Included in this total was £125,901 from the estate of the late Mrs Monica Dyer and £70,456 from the late Canon John Barnes. Both legacies were subject to certain conditions. The Dyer Bequest is for the Society’s general purposes, but its use is subject to consultation with the Wessex and Dart Branch. The Barnes Bequest was specifically intended for the Waverley and an immediate grant was paid to WSN for the full amount of the bequest. The Society has no paid employees so its achievements reflect members' voluntary efforts. These cover a wide range of skills and are essential to the continued successful operation of the Society. The Council of Management acknowledges gratefully all contributions great and small. There was a net reduction of 124 members during 2017, a fall of 4∙9%. To maintain the operation of the Society, including delivering annual and life subscriptions paid in advance. The Council of Management has set this sum at £50,000. To continue the development of its Archive Collection. The Council of Management has designated the Archive Development Fund of £48,651 for this activity. To provide for the refit or repair of PS Waverley should WSN not have funds to do so. The Council of Management believes this reserve should be £500,000, to be drawn down when needed. To provide for a pledge of £50,000 towards the restoration to operating condition of PS Maid of the Loch. To provide a sum as match-funding for a possible future grant application by WSN. At 31 December 2017 £70,782 was set aside for this purpose. The Society has not adopted a formal fundraising policy. However, its fundraising efforts, which are all volunteer-led, are largely directed towards its members. The only material exceptions have been the sale of lottery tickets to passengers on board Waverley and the promotion of special cruises on Waverley. New members are recruited by the use of leaflets, through the Society’s web site and social media channels. The Society is the majority shareholder in Waverley Steam Navigation Co. Ltd. (WSN) (itself a registered Scottish charity - SC005832)). PS Waverley is owned on behalf of the Society by WSN and operated by Waverley Excursions Ltd., a wholly owned subsidiary of WSN. The Society is also the majority shareholder in PS Kingswear Castle Trust Ltd. (PSKCT) (itself a charity registered in England and Wales as no. 299931). Paddle Steamer Kingswear Castle is owned on behalf of the Society by PSKCT. Since 2013 she has been chartered on a long-term basis to Dart Pleasure Craft Ltd (DPC) who are operating her on Dartmouth harbour cruises and between Dartmouth and Totnes. DPC is a wholly owned subsidiary of Dart Valley Railway PLC (DVR), in which the Society has a small shareholding. It should be noted that although DPC, as charterer, is responsible for the bulk of maintenance, PSKCT retains the responsibility as owner to fund major renewals, such as of the hull, boiler and main engine. For this reason, the Society previously granted PSKCT £333,709 to form a long term maintenance reserve. Supporting PS Waverley to ensure she continues to operate remains the top priority of the Society. In 2017 the Society continued its policy of providing financial support to WSN. The Society gave a grant of £57,365 to fund a replacement spring beam on Waverley’s starboard paddle box (£50,865) and to fit new engine room insulation and ventilation (£6,500). The Scottish Branch has arranged some very successful charters of PS Waverley for a number of years and again their charter of Waverley in 2017 generated a surplus. The Scottish Branch continued its policy of supporting Waverley by awarding grants to WSN. In 2017 they passed £9,000 to WSN to fund repairs to flooring in the various lounges on board the vessel, undertake repair work on the ship’s PA system and purchase paddle floats including some spares which were quickly utilised following an incident where three floats where damaged at Portree. The Scottish Branch also produced and published a 70th anniversary souvenir booklet to mark 70 years since Waverley entered service. The booklets were donated to WSN which therefore benefited from the proceeds of sales. The Scottish Branch held a Waverley Grand Draw during 2017 and proceeds (£6,713) from that were passed to WSN as a grant. In total, including the Barnes Bequest, £143,722 was contributed to WSN during 2017 from the Society to keep Waverley in sailing condition. In 1987 a tiny crack developed on one of the lugs to which a stay bar is attached on the external part of the casting of PS Kingswear Castle's low pressure cylinder. This was repaired at the time but, during the 2016 season, the crack re-appeared. Consequently, it was decided to start on a rebuild of her engine, with the first part being to cast a new low pressure cylinder. However owing to a fault in the newly cast cylinder the existing cylinder was further repaired. In putting the engine back together further problems developed with the crankshaft and its alignment. As a result, all the crankshaft bearings required work with the re-assembling involving laser alignment. The extended works delayed the vessel’s entry into service until early July. The owner’s share of the expenditure on engine works was £54,989 and this was funded by PSKCT through the previously granted maintenance reserve provided by the Society. The Society also supports financially the preservation of PS Maid of the Loch, which is owned by Loch Lomond Steamship Company (LLSC), an independent Scottish charity (SC024062). LLSC is one of the bodies to which the Society is allied, having aims related to the preservation of large pleasure steamers, and with which close links are maintained. In 2015 LLSC were awarded a First Stage Heritage Lottery Fund (HLF) grant of £263,996 to enable complete plans and specifications for the rebuilding project to be prepared. Successful completion of this stage will pave the way for a full grant of £3∙8m but this required £1∙7m of matched funding. By late 2017 the matched funding raised was around £0∙6m but an HLF extension deadline was granted to submit a Stage 2 application in June 2018 and September 2018 to close the funding gap. The Society distributed a newsletter produced by LLSC with the winter edition of Paddle Wheels informing members of a Maid of the Loch Donation Scheme. The Donation Scheme offered members the opportunity to purchase tickets, Maid of the Loch souvenirs and items required to return the ship to passenger service on Loch Lomond. The Society communicates to its members by publishing a quarterly Journal Paddle Wheels. During 2017 there was a review of the publication which resulted in significant change to the format, printing and distribution methods. These changes were implemented for the winter 2017 edition and this has resulted in a significant reduction in cost. Paddle Wheels is now published as an A4 magazine and is posted to members using the services of a mail distribution company which can benefit from mailsort postage rates. The Society also communicates with non-members through its website (www.paddlesteamers.org) which is regularly updated with news about our ships and carries featured articles and postings of wider paddle steamer interest. During 2017 the Society’s Facebook page and Twitter account were further developed with almost daily postings and sharing of information. The Scottish Branch established a YouTube Channel which carries a range of videos on Waverley and others of wider paddle steamer interest. Through expanding the Society’s Social Media presence its aims of educating the wider public can be better served. In addition the Society has started to produce its own videos using items held in its Archive Collection. The Society has a specialised Archive Collection which is currently valued at £50,742 (2016: £56,263). The Collection has been accumulated over the 58 years of the Society’s existence and ranges from ship models to ship’s furniture, sailing handbills, postcards, pictures/slides and company records. To fulfil its educational role the Society is working to make its collection more accessible for research with a number of objects already on loan for display purposes to appropriate museums. During 2017 further items were donated to the Collection including photo albums and models including a large model of PS Koningin Wilhelmina. A sub-committee of three, including two Council of Management trustees, has responsibility for managing the collection. One trustee deals with the day to day running. Long and short term plans have been created and a five-year budget has been approved. The Archive Development Fund (which partially funds this work) has benefited from contributions from individuals. The London and Home Counties Branch funded the conservation of some rare tracings of PS London Belle. In addition, the Council of Management has decided to add 5% of non-specific bequests to the Fund. With the help of the volunteer team, work continues with cataloguing items with material split into sub-collections. This resulted in a review of the box storage. The team is now focused on cataloguing non-accessioned collections and has made a start on sorting and cataloguing postcards and photograph albums. It is acknowledged that the Society’s strength is its members. However, owing to a continued decline in the number of members and with competition for new and existing members from the Friends of Waverley membership scheme run by WSN the Council of Management has continued to review the operation of the Society. At the AGM there was a special resolution passed to replace the ‘Junior’ membership category with a ‘Young Person’ category to encourage those beyond school years and under the age of 26 to join. Additionally the ‘Senior’ category was removed for new members. During 2017 the Council of Management agreed to produce a Development Plan to allow the Society to identify its priorities and actions for the next three years. (1) Waverley Steam Navigation Co. Ltd.
(3) Paddle Steamer Kingswear Castle Trust Ltd. Basis of accounts: These Accounts have been prepared in line with Financial Reporting Standard 102 (FRS102) and the Charities’ Statement of Recommended Practice (SORP2015) but do not fully comply with them (see note 1.2). They were prepared in accordance with applicable company and charity law. The accounts are prepared on an income and expenditure basis. The society is a public benefit entity. Despite the departures set out in Note 1.2, the Council of Management has concluded that the accounts present a true and fair view of the Society’s financial position. Group accounts: As permitted by Section 405 of the Companies Act 2006, the Council of Management has not prepared group accounts on the grounds that as the subsidiaries are constituted as charities there are severe long-term restrictions over the assets of the subsidiaries and that disproportionate expense would be incurred in the preparation of group accounts. See note 4 for details of subsidiary undertakings’ results. The Standards require Group Accounts. Legacies: These are recognised at the time of receipt and no allowance is made for the undistributed part of any legacies due. The Standards require inclusion in Income upon notification. Loans to Waverley Steam Navigation Co Limited (WSN): These are shown at their full value within Total Assets although a full doubtful debt provision has been made and is included in Liabilities, reflecting the fair value of the loans. The Standards require loans to be shown at their fair value which would mean neither balance would be disclosed. Annual Membership subscriptions: As the subscription year runs from August to July for the bulk of members, this income is apportioned between the appropriate financial years. Life Membership Equalisation Account: Life membership subscriptions are credited to this account upon receipt and are then recognised as Income in equal instalments over 20 years. Donated Heritage Assets for Archive Collection: These are recognised at their estimated market value. Stocks: Stocks of unsold goods, if any, are valued at the lower of cost or realisable value. Investments: Programme related investments are included at their nominal value or historical cost less impairment. Investments held to generate income or for their investment potential are valued at fair value. Gains/losses on investments: Gains and losses are recognised in the year they arise. Unrealised gains or losses are added to or deducted from the Fund to which the investment relates and the total is shown in the Revaluation Reserve. Grants: Liabilities arising from grant commitments made by the Society are recognised by creating a provision pending the fulfilment of conditions at which point the obligation becomes binding. There were no disposals during the five year period. The holding of shares in PSKCT, the owner of PS Kingswear Castle, represents 83% of shares issued. The shares are shown in the accounts at their nominal value as shareholders in the Trust cannot benefit from their holdings, as it is constituted as a charity (registered in England and Wales as no. 299931). At 30 April 2017 the aggregate amount of its capital and reserves was £889,371 (2016 restated - £894,437), both including £333,709 transferred from PSPS, and its net expenditure for the year then ended was £5,066 (2016 restated – net income of £6,418). The holding of shares in WSN, the owner of PS Waverley, represents 70% of shares issued. The shares are shown in the accounts at their nominal value as shareholders in the Company cannot benefit from their holdings, as it is constituted as a charity (registered in Scotland as no. SC005832). 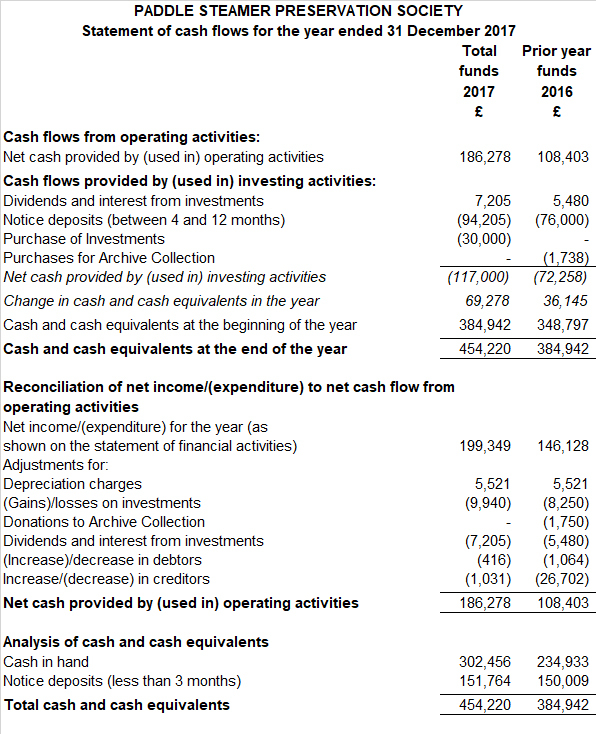 At 31 October 2016 the aggregate amount of its group capital and reserves was £3,499,995 (2015 - £3,588,972) and its group net expenditure for the year then ended was £88,977 (2015 - £45,722). The Loans to WSN are interest free and are repayable on two years’ notice expiring on 31 March in any year. Full provision of £117,201 has previously been made to reflect the likelihood of repayment of the long-term loan balance. The shares in Dart Valley Railway plc (DVR) were donated to the Society. DVR is the ultimate holding company of Dart Pleasure Craft Limited, charterers of PS Kingswear Castle. They are shown at their value at the date of acquisition. 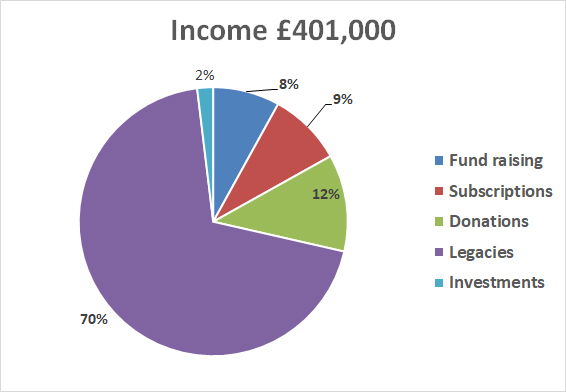 Other Investments held to generate income or for their investment potential consisted of a holding in Charities Official Investment Fund Income Units in both 2016 and 2017. Debtors consisted of prepayments and accrued income in both 2016 and 2017. Restricted Funds comprise the Restoration and Preservation Fund, which holds funds received for or allocated to PS Waverley and PS Kingswear Castle, either in general or specifically and the Barnes Bequest which was specifically intended for the Waverley and an immediate grant was paid to WSN for the full amount of the bequest. The Revaluation Reserve represents the unrealised gain on investments allocated to the Restoration and Preservation Fund. The Dyer Bequest is for the Society’s general purposes, but its use is subject to consultation with the Wessex and Dart Branch. The Archive Development Fund has been designated for the development of the conservation of and access to the Archive Collection. The Archive Collection Reserve represents the value of donated items, after deducting accumulated depreciation. Grants All grants made were to other charities in pursuit of the Society’s objects of preserving in operation paddle steamers and maintaining a collection of historical material relating to paddle steamers. In general, grants are only made towards work on the fabric of the vessels supported. Commitments: At 31 December 2017 there were no unprovided commitments (2016: Nil). Related Party Transactions: The Society is related to the following companies because it has a majority shareholding, as set out in the Trustees Report. There were no transactions during 2016 or 2017. There was no balance outstanding at either year-end. The Society had outstanding loans of £117,201 to WSN at 31 December 2017 (2016: £117,201). During 2017 the Society made grants of £143,722 (2016: £78,944) to WSN for PS Waverley. The Society chartered PS Waverley during 2017 at a cost of £3,563 (2016: £7,350). Trustee Remuneration: None of the trustees have been paid any remuneration or received any other benefits from an employment with the Society (2016 - Nil). No person connected with a trustee received any remuneration from the Society (2016: Nil). Trustee Expenses: 12 trustees received reimbursements of travel and accommodation costs incurred in the course of their duties totalling £3,604 (2016 - £3,339). Staff Costs and Employee Benefits: Nil (2016 - Nil). Cost of Independent Examination and Other Financial Services: £1,200 was accrued for independent examination services to be provided by Peter Walker FCCA (2016 - £1,110) and he provided no other services to the Society (2016 - Nil). 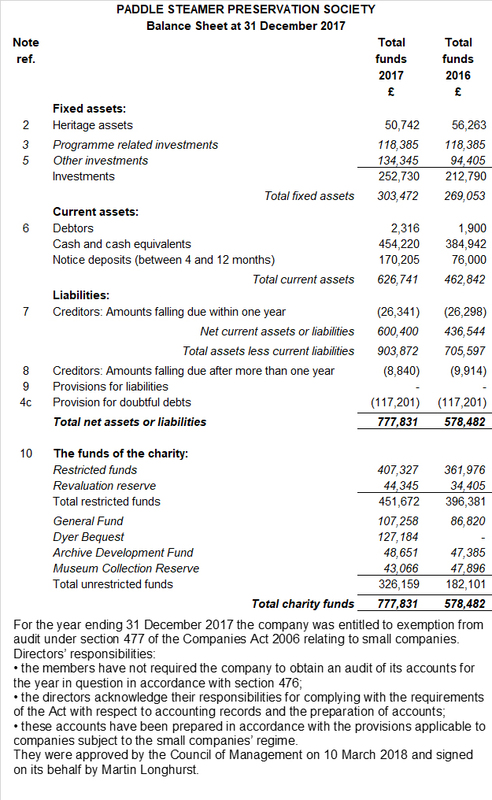 I report to the charity trustees on my examination of the accounts of the Society for the year ended 31 December 2017. As the trustees of the Society (and also its directors for the purposes of company law) you are responsible for the preparation of the accounts in accordance with the requirements of the Charities and Trustee Investment (Scotland) Act 2005 (‘the 2005 Act’), the Charities Accounts (Scotland) Regulations 2006 (as amended) and the Companies Act 2006 (‘the 2006 Act’). You are satisfied that the accounts of the Society are not required by charity or company law to be audited and have chosen instead to have an independent examination. Having satisfied myself that the accounts of the Society are not required to be audited under Part 16 of the 2006 Act and are eligible for independent examination, I report in respect of my examination of the Society’s accounts carried out under section 44 (1) (c) of the 2005 Act and section 145 of the Charities Act 2011 (‘the 2011 Act’). In carrying out my examination I have followed the requirements of Regulation 11 of the Charities Accounts (Scotland) Regulations 2006 (as amended) and the Directions given by the Charity Commission under section 145(5)(b) of the 2011 Act. Since the Society is required by company law to prepare its accounts on an accruals basis and is registered as a charity in Scotland your examiner must be a member of a body listed in Regulation 11(2) of the Charities Accounts (Scotland) Regulations 2006 (as amended). I can confirm that I am qualified to undertake the examination because I am a registered member of the Association of Chartered Certified Accountants which is one of the listed bodies. the accounts have not been prepared in accordance with the methods and principles of the Statement of Recommended Practice for accounting and reporting by charities, except as disclosed in the Notes to the Accounts. I have no concerns and have come across no other matters in connection with the examination to which attention should be drawn in this report in order to enable a proper understanding of the accounts to be reached. The Society’s net income for the year was £199,000, compared to £149,000 in 2016. 2017 was an exceptional year for the receipt of legacies which has boosted our net assets to £778,000. This means we have been able to start setting aside a sum as match-funding for a possible future grant application by WSN. 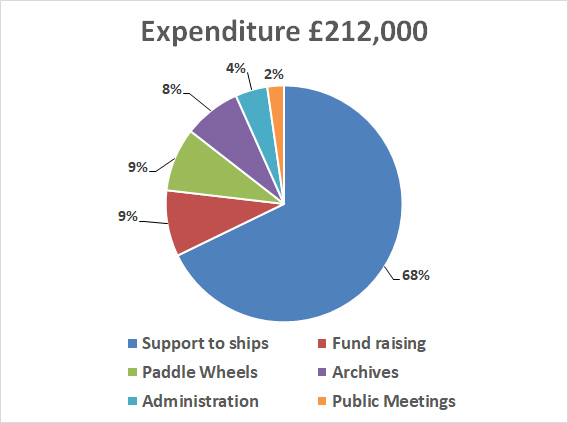 We aim to fund our regular activities (Paddle Wheels magazine, our Archive and our public meetings) from our subscriptions, meaning almost all donations can go to supporting paddle steamers. The Society contributed almost £144,000 to help keep the Waverley sailing. This remains our top priority. We constantly seek optimum value for money in all our activities and instituted more economical printing and distribution arrangements for Paddle Wheels magazine during 2017. The accommodation of our Archive Collection was rationalised to reduce overheads and enable more spending on conservation and protective storage. The Society holds reserves to provide for the refit or repair of PS Waverley, should WSN not have funds to do so (£500,000), to provide a sum as match-funding for a possible future grant application for PS Waverley (£71,000), to contribute to the PS Maid of the Loch project (£50,000), to continue the development of its Archive Collection (£47,000) and to maintain the operation of the Society (£50,000).